Pixus Technologies, a provider of embedded computing and enclosure solutions, has developed ruggedized versions of commercial software defined radios. The RX310, the first in the series of small form factor ruggedized devices, utilizes the USRP software defined radios from Ettus Research, a National Instruments brand. The weatherproof enclosure features IP67 sealing for water and dust ingress. It is also designed for MIL-STD-810 for shock/vibration and MIL-STD-461 for EMI. The RX310 contains two extended bandwidth daughterboard slots covering 10 MHz – 6 GHz with up to 160 MHz of baseband bandwidth, dual 1/10 GigE high-speed interfaces, and a large user-programmable Kintex-7 FPGA. The unit is 302mm wide x 400mm long x 98mm tall with conduction-cooled fins for heat dissipation. The RX310 series can be used in various types of airborne, shipboard, ground vehicle, or outdoor designs. Example applications include SIG-INT, spectrum monitoring, passive RADAR, smart agriculture, smart energy, and prototyping systems for advanced wireless standards. Pole-mount and other special mounting options are available. 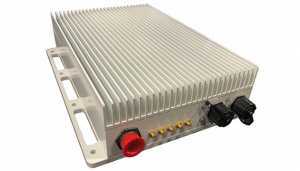 Light-rugged versions of the enclosure are also available upon request, as well as ruggedized versions of other software defined radios offered by Ettus Research.